How to Use Exposure Compensation to Correct Automatic Exposure to adjust the wrong exposure calculated by the camera, that is what we are going to explain. Previously we discussed about Exposure Compensation in Digital Photography, that was more theoretical. The optical or mechanical control of Exposure will not be discussed here, the title How to Use Exposure Compensation to Correct Automatic Exposure probably tells the thing – it is a practical guide on Exposure Compensation. The obvious question should arise if the question how to use exposure compensation has not came from your mind first. The algorithms for the automatic calculation of exposure usually do a good job. In some cases, however, there is no way to ensure that the camera produces a shot with the exposure they want. In other words, there are situations in which the camera continues to underexpose or overexpose the image. Usually, this problem occurs when a considerable part of the scene has too much or too little light. In these cases, when we use a shutter mode in automatic or semi-automatic , the camera, tries to get a correct exposure for these “extreme” other parts that might be more important for us. The cameras have the shutter modes like Program, Aperture-priority and time priority (indicated by the letters P, A, S, the special selector) and provide a very nifty in these cases is that the exposure compensation. We wrote about these Manual Modes of DSLR and Semi Automatic Modes in details before. Usually, the exposure compensation is accessible through the menu or through the pressure of a button combined with the rotation of the ring which is located on the back of the camera. The purpose of this tool is to say the camera to acquire more or less light than the amount measured automatically. 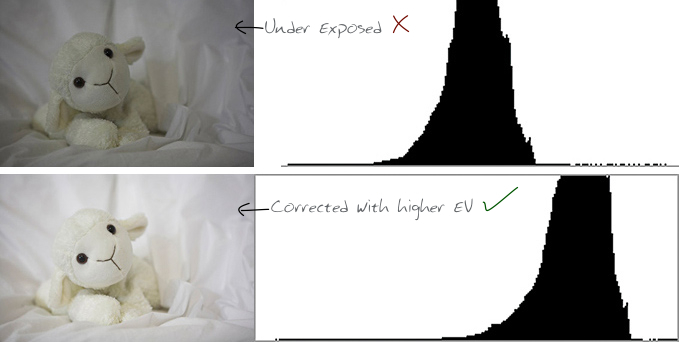 The change compared to the exposure automatically calculated is measured in EV (Exposure Value). An EV corresponds to a stop. Usually, cameras has increments or decrements of 1/3 or 1/2 EV. The maximum compensation, which is growing decreasing, depending on the camera model, but is usually at least 2 EV. When we set the exposure compensation to a negative value, we are asking the camera to capture less light. So we get a picture darker than that which would be obtained by the exposure calculated automatically. Conversely, if the exposure compensation to a positive value, we get a picture more brighter. A typical situation in which a negative exposure compensation will be used is, when you photograph a subject normally illuminated with a very dark background. It happens to everyone, for example while having to photograph a Christmas tree decorated with lights. Trying to properly expose the tree, which was quite dark and in the evening, the camera had elevated the exposure time in order to capture more light. In this way, the lights become overly dazzling. So need to set the exposure compensation to -0.7 and got a picture in which the tree was so dark, but the lights becoame more normal and enjoyable. A positive exposure compensation is rather useful for example when you are take pictures in the snow. The snow reflects a lot of light and is very harsh, therefore it deceives the algorithms of the camera. Taking into account that the larger part of the picture is too bright, the camera will reduce the exposure time or aperture, resulting in a photo which is probably underexposed. Using exposure compensation to a positive value, we will ensure that the camera will acquire more bright shot with correct exposure. Unfortunately, it is difficult to find any absolute rules in each situation that tells us what value to use. Rather, it is best to keep in mind that, in situations where the automatic calculation of exposure fails, we can intervene and correct exposure with exposure compensation. The rest is done by experience and a trained eye. Evaluating the available light and the composition of the scene and keeping in mind the values ? ?used in turn for compensation, we learn to guess the correct value to use without the need for going to trial after lot of practice. This Article Has Been Shared 2619 Times! How to Avoid Blurry Photos in Digital Photography is very basic concept and the blur of a photo can not be corrected by editing.Learn how to take sharp picture. Deep Focus in Digital Photography is a technique where a large depth of field is obtained by using wide angle lenses and the smallest possible aperture. Cite this article as: Abhishek Ghosh, "How to Use Exposure Compensation to Correct Automatic Exposure," in The Customize Windows, May 5, 2013, April 26, 2019, https://thecustomizewindows.com/2013/05/how-to-use-exposure-compensation-to-correct-automatic-exposure/.